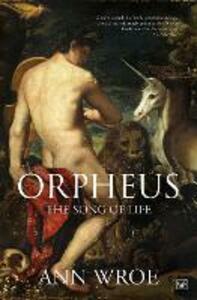 For at least two and a half millennia, the figure of Orpheus has haunted humanity. Half-man, half-god, musician, magician, theologian, poet and lover, his story never leaves us. He may be myth, but his lyre still sounds, entrancing everything that hears it: animals, trees, water, stones, and men. In this extraordinary work Ann Wroe goes in search of Orpheus, from the forests where he walked and the mountains where he worshipped to the artefacts, texts and philosophies built up round him. She traces the man, and the power he represents, through the myriad versions of a fantastical life: his birth in Thrace, his studies in Egypt, his voyage with the Argonauts to fetch the Golden Fleece, his love for Eurydice and journey to Hades, and his terrible death. We see him tantalising Cicero and Plato, and breathing new music into Gluck and Monteverdi; occupying the mind of Jung and the surreal dreams of Cocteau; scandalising the Fathers of the early Church, and filling Rilke with poems like a whirlwind. He emerges as not simply another mythical figure but the force of creation itself, singing the song of light out of darkness and life out of death.